I’m here to talk about your brain. Talking about useless foods, did you know that your brain is about the consistency of Jello? The brain is also the most complex thing in the entire universe (that we know of – now that we are discovering endless other planets, maybe there is something more complicated out there. Maybe they are so smart they know better than to let us know they exist.). Does the brain matter? The Egyptians believed the cavity between our ears was merely the repository of snot and they sucked it out when embalming their dead, considering it superfluous. We have now learned that the Egyptians were wrong. Despite what the Egyptians thought, our brains are pretty damn important. The brain does a lot. It makes it possible for us to think, feel, perceive, make decisions, love, imagine things that never existed, move, act, breathe, and do it all while doing the Cupid Shuffle. Aren’t some of these the kinds of things we work on in therapy? Most people come into therapy because of problems with how they feel about themselves, because they are making bad choices, feel depressed or anxious, can’t focus, have relationship difficulties, etc. And therapy can really help with these kinds of problems. I could go on about why therapy is good for you, but that’s for another article. Here’s the thing for this one: even though therapy is the thing that I do, and I love it, I have to admit, it’s only part of a complete breakfast. It’s necessary for us to get better, but not sufficient. If that’s the case, what are the other parts? If you want to solve the problems you’ve come to therapy to fix, another really important part of that complete breakfast is making that all important organ where all this stuff happens — your brain — healthy. 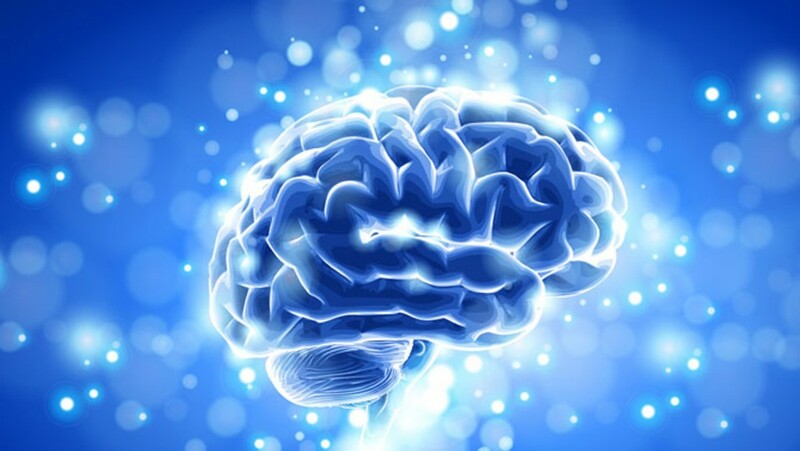 Yes, your brain can be more or less healthy. Here’s a fun fact you should know, for example, and one that you’ll hear me repeat many times. If your BMI (Body Mass Index – which is kind of a measure of how much fat you have) is kind of high, your brain will be 4% smaller. If your BMI is really high, you will lose about 8% of your brain. With a shrunken brain, you are more likely to be in a bad mood and not think clearly. 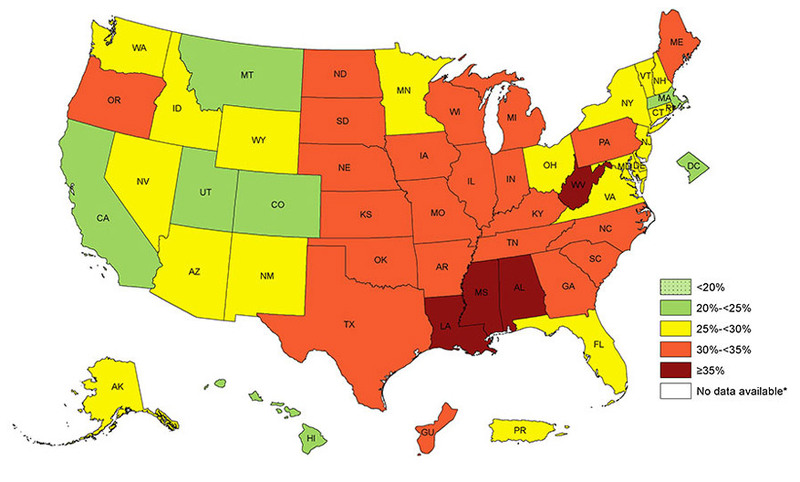 No, that’s not an electoral map, it’s an obesity map. I’ll say no more about that right now. Back to that complete breakfast, and brain health. Think about it this way. Your brain needs certain chemicals called neurotransmitters to work right. Too little dopamine and you can’t focus or make good decisions. Too little serotonin and you are an anxious wreck. Now where do you think these chemicals come from? They come from the food you eat. Eat some turkey and down the line you’ve got neurotransmission going on. How does that happen? Let me grossly oversimplify. The body is an extraordinary machine. In order to get energy and neurotransmitters out of the food you eat, the body transforms that food through an amazing number of biochemical steps. These processes are regulated by your genes – that’s kind of the body’s hardware, the basic programming that turns switches on and off at the right time – but they are also dependent on how well your body is working, and what you put into it. You need the right foods, vitamins, and minerals to turn protein into amino acids and turn those amino acids into neurotransmitters. The body can’t do as good a job of that with an artificial sweetener as it can with spinach. In the beautiful complexity of body and brain, science shows us that it takes an orchestra of parts working in harmony to make the beautiful symphony that leads to you functioning full-tilt, which is the real definition of health. Uh oh! You say. You are probably worried and/or certain that you are not doing the many things you need to do to have a healthy brain, and you are probably worried that I am going to tell you all the things you should be doing to have a healthy brain and you are probably worried that you are not going to be able to do them, and this is only going to make you feel worse about yourself, which will lead to you having even less healthy neurotransmitters in your brain! Wrong! I’m not even going to tell you ONE thing you should be doing to have a healthy brain. At least not until my next missive. But I will tell you how we’re going to change your brain for the better. We’re going to use the 1% Solution. Hopefully, as you become increasingly aware that how you treat your precious brain impacts just about everything about you, you will begin to look at the things you do in a different way, and start to make little decisions to improve that “complete breakfast,” (less donuts, more protein shakes! – oops, I made a recommendation, sorry!) in small ways every day. The good news is that science tells us that we can learn, we can improve our habits, and with a little effort we can have far healthier brains which will make everything we are trying to achieve in and with therapy that much easier and better. If every day you make one little thing better, before you know it you’ll get the big changes you never believed you could make. As Dr. Daniel Amen says, when your brain works right, you work right. Having a healthier brain can help you be in a better mood, make clearer and better decisions, have better focus, have more fulfilling relationships, stave of cognitive decline and Alzheimers, recover from injuries and trauma, be in better physical shape, and stop cravings. Put all that together and it can contribute to you living a longer, happier life.